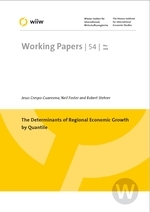 We analyse the robustness of potential determinants of the differences in the long-run growth rate of GDP per capita across EU regions using quantile regression. We propose using Bayesian Model Averaging (BMA) methods on the class of quantile regression models in order to assess the set of relevant covariates in cross-regional growth regressions allowing for different effects across quantiles of the growth variable. The results indicate that the set of robust growth determinants differs across quantiles. The set of robust variables includes skill endowment and initial GDP per capita when not and physical investment when taking country fixed effects into account. However, even when a variable is found to be robust across quantiles the estimated impact on growth of that variable is often found to differ across the quantiles.